-Dustin Boles, former pastor of Mosaic Church, in an email to Mosaic Church staff. “Please understand that we are not withholding details to protect Dustin. We are protecting those who were hurt by his sin. …This news comes as a shock to all of us, and we do not discount the hurt that this has caused the families effected and the congregation as a whole. …The mission still stands and the vision is still clear. Our faith and hope is founded in Jesus Christ through God’s divine plan. “Let this be a lesson to all the church. You cannot keep this sort of stuff a secret nor should you keep this stuff a secret. The community has a right to know what the highly publicized, public figure, Dustin Boles, has been up to. You wanted the public to come to your church, to listen to your teaching, and to realize how much you care for your community. You do not get to hide the bad stuff. If you truly understand the gospel, you’ll be open and honest about the situation. The slant I am going to take on this story is that, regrettably, organized religion is a business. Most church members do not want to believe this; nor do I. But time after time I have seen scandals come to light in a church and time after time I have seen church leadership handle the scandal poorly. Boz Tchividjian has said that “the priority of church leadership when learning of an abuse disclosure is the protection of the abused, not the protection of the church.” Boz Tchividjian is right; this type of a response is what reasonable church members expect. But this is not what we see. Why not? Because church leader’s first concern is invariably protecting their abusive colleague and protecting the church business. Admitting to their grievous sins and doing whatever it takes to care for the victims may be bad business. Members will leave, others will cut their donations. Churches may not be able to make their mortgage payments and pastors may have to be terminated. It is never cool for these churches who are attempting to reach “mega-church” status, or for the lead pastor who is attempting to become a member of the “Christian” celebrity club to be leading a church that is losing members. Yeah, that sounds just like what Christ would want! Take your church to the “next level” because you owe it to the disgraced, sexually abusive, former lead pastor. One also wonders about the euphemistic “all.” When Molyneaux states “that’s what we all want” does the “all” refer to the five elders, or does it refer to the entire church membership? I find it rather difficult to believe that Molyneaux polled the entire membership to determine what they “all” wanted. I bet he didn’t even ask the victims and their families what they wanted. Can you imagine any of the women Dustin Boles sexually abused, when asked what they wanted the church to do, replying with “I want this church to take it to the next level because we owe it to Dustin?” Clearly not. It should be noted that elder Doug Molyneaux’s wife, Angie, is the Financial Administrator for Mosaic Church. Molyneauxs have been involved with Mosaic Church since its early days and undoubtedly have invested much, both financially and emotionally. 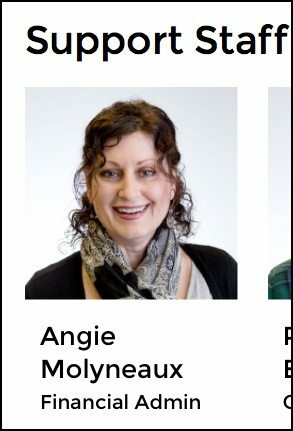 The fact that Angie Molyneaux also derives a paycheck from the church creates an additional incentive for the Molyneauxs to keep the “business” of Mosaic Church afloat. Church leadership wasted no time in moving to find a new, charismatic lead pastor. It is crucial to have as little “down time” as possible. One “amazing” preacher must be replaced by another “amazing” preacher quickly, otherwise, the church will start to bleed members. A church bleeding members is a church with a shrinking income. Mosaic Church is scheduled to move into a beautiful, new building in October. Undoubtedly the leaders are very nervous about the loss of “giving units.” Therefore, prior to even advising the membership that lead pastor Dustin Boles had resigned, they had already hired a company to find a new man-o-gawd; a man who had the call of God on his life to pastor Mosaic Church. One wonders what kind of church polity exists at Mosaic Church, but it’s clear that members have no input. Boles actions and the action of the elders clearly paint a picture of a leadership that is accountable to no one. This is not novel. I attended three churches that operated in similar fashion. Members are not to question those in authority, just dig deep when the offering plate is passed. Members bold enough, or stupid enough to raise questions are quickly tagged as divisive and will never obtain the inner circle of “servant leadership.” Paint me as one of those divisive individuals; I am a slow learner – I questioned pastors at all three churches. Reactions were all pretty much the same – icy stares followed by shunning. It’s a funny thing to see how God moves these days. We may have to do away with the doctrine of God’s immutability as he appears to be somewhat emasculated. In less technological days God could be counted on to answer prayer and provide a preacher for a church. These days He seemingly has to rely on businesses such as “Slingshot” who make a handsome profit matching preachers with churches. It’s not unlike a Christian dating service, or perhaps a better example would be the Ashley Madison “dating” service. So, two weeks after the resignation of Dustin Boles, Todd Clark of Slingshot rides into town to take stock of the Mosaic Church. Clark, after spending a few days at Mosaic Church, admits most of the members probably didn’t even know he was there, but he knows they are incredible and amazing, he was honored to be with them and he loves them all. Can you really “love” someone you do not even know? Perhaps Clark “loves” them because they are unknowingly paying his salary? Finally, in a statement which sounded eerily familiar to what mega-church pastor wannabe, Davey Blackburn frequently states, Clark said that he believes “the best is yet to come” at Mosaic church. Clark went on to say that he has been in touch with “dozens and dozens and dozens and dozens of interested lead pastor candidates.” (By my math that is at least 96 pastors.) Clark will soon narrow the field down to 5 or 6 top candidates and present those portfolios to Mosaic leadership who will then discern who God has called to lead Mosaic church. Oooh, this is so exciting. It reminds me of the NFL draft day! Left unsaid is just how much the “finder’s fee” will cost the faithful, but hey, if you wanna play, you gotta pay! Inquisitive Mosaic members may wish to pose that question at a future members meeting. (They do have those, don’t they?) You can bet it’s not cheap. Slingshot has dozens and dozens and dozens and dozens of employees. 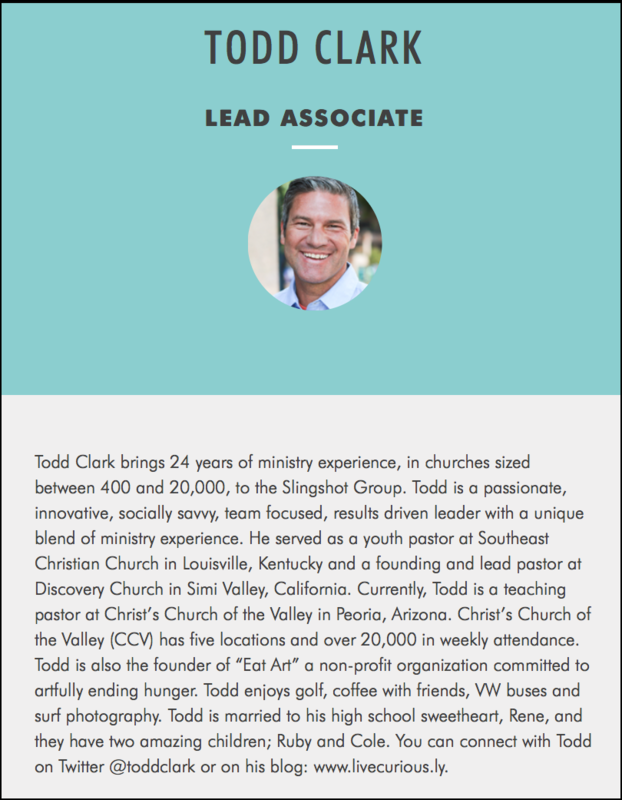 Todd Clark is one of the senior men in the company and recently quit a job as pastor of a group of churches in a Phoenix suburb with 20,000 members. I do not know what his salary was, but I would guess it was significant. Clark has moved to Huntington Beach, CA. where it appears the majority of his income will be from Slingshot. The cost of living is significantly higher in California than Arizona, you can bet his income is also higher. 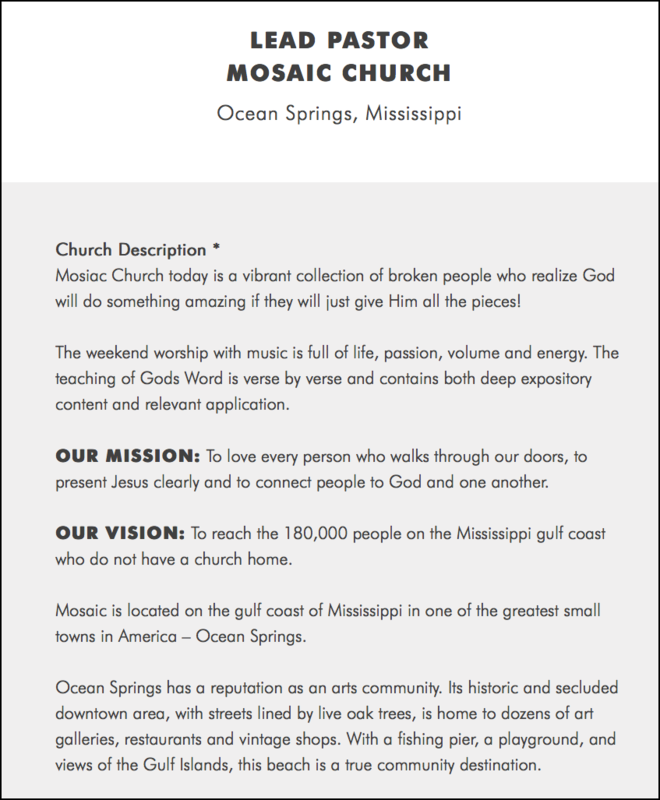 Here is the job description for Mosaic Church. As mentioned earlier, according to Todd Clark, there are roughly 96 individuals who are feeling, to one degree or another, the calling of God to apply for the position. I wonder what the victims think of all this? I wonder what God thinks? I wonder when Christians attending corporate churches across the nation will wake up? Audio of Mosaic church publicly addressing the resignation of Dustin Boles in the worship service July 10, 2016. Bully in the Pulpit, Mortification of Spin podcast. As a person who previous attended Mosaic I can attest to many of the comments. As for Doug Molyneaux…he’s an egotistical, power hungry overlord. I also attended another church (now defunct) where he was also an elder. He is drunk on power. And as you mentioned, his wife is the financial administrator of Mosaic. He makes the financial decisions and she manages the church coffers. Do you see conflict of interest and a high potential for impropriety? I don’t know any other business that would allow a husband and wife to have their co-joined hands in the cookie jar. Thanks for the comment Former Mosaic attender. And yes, I see the conflict of interest and high potential for impropriety. I hope many Mosaic members do as well. Perhaps then they can get work to get some proper accountability established in the church. Here is a look at just three **qualifications** for elder/overseer from Titus. Seems, most who call themselves “pastor/elder” tend to “Ignore,” or “Twist,” these qualifications so they can maintain their “Titles,” pastor/leader/reverend, that comes with Power, Profit, Prestige. 2 – Just. 3 – Holy. Strongs #1163, die. – It is necessary (as binding). Thayer’s – necessity established by the counsel and decree of God. Seems to be a small word but very important. Yes? Strongs #410 anegkletos – unaccused, irreproachable, blameless. Thayers – cannot be called into account, unreproveable, unaccused. Dictionary – Without fault, innocent, guiltless, not meriting censure. Thayers – righteous, observing divine laws, innocent, faultless, guiltless. religiously observing every moral obligation. Now that’s three tough qualifications for elder/overseers. Yes? but the proud he knoweth afar off. Until the junk hits the fan. They just say they do. I’ve had comments deleted when I list these tough Qualifications. They make all kinds of excuses, twists and turns. Yes it is A. Amos! 10 p.m. over here in the Middle East, almost time for bed! I always have a little laugh when I see Qualifications listed by a 501 c3, for a “Title/Position” that does NOT exist in the Bible, for one of His Disciples. in 1 Timothy 3:1-11; Titus 1:6-9; and 2 Timothy 3:14-4:5.
with the ability to connect with all generations. in a practical and relevant way. 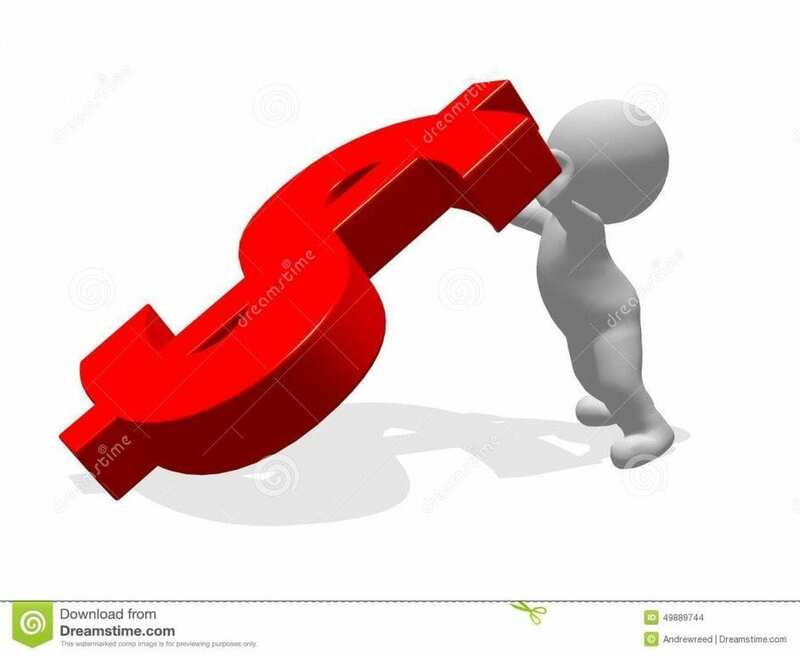 1 – A humble servant leader??? But, but, but… “servant-leader” is NOT even mentioned in the Bible. And Humble??? = having a modest or low estimate of one’s own importance. Would someone who is “Humble” admit to that? I’m applying for this position of “Lead Pastor” because I meet all your Qualifications. “1 Timothy 3:1-11; Titus 1:6-9.” as you request. And they are tough. “1 Timothy 3:1-11; Titus 1:6-9.” So I can remain and keep the money flowing. And begin to think, I’m a Great Leader. Which is what you really want. Everyone is “amazing” and/or “awesome”. If they really understood, they would know Mosaic “DNA” matches Dustin Boles. But that is really a good thing to them because he was really “amazing” except for that little perversion problem. This post helps to outline just how and why the most shallow and authoritarian are attracted to ministry. Thanks for commenting Lydia. I also noticed the use of the word “leveraging.” It must be the latest addition to Christian hipster vocabulary. Winsome, missional, vision casting language can always be leveraged to keep the giving-units on task, lead the church to the next level, and increase your salary. It will serve you well. I find it all repulsive. I look at this entire scenario with a mixture of sadness and disgust. Yes, the leaders should be held accountable but it’s also a statement of the state of the average “church attender” who simply wants to be entertained and have their ears tickled as long as they pay their country club dues (10%). I don’t know if you noticed on the qualifications for pastor but the “preferred” degree for the pastor is a Masters of Divinity. They wouldn’t dare want to have one of those Masters of Theology types who might actually want their practices and messages to be of sound doctrine. Thanks for the comment. I share your feelings. Perhaps you could briefly share what the difference is between a Masters of Divinity and a Masters of Theology. I confess I am ignorant. I am guessing theology entails much more study of the Bible, whereas Divinity would cover counseling, financial aspects of church, etc. It’s a lot more complicated than it was when I was in seminary (30 years ago) but where I went to school, the biggest difference was that a Th.M had a much bigger emphasis on the original languages plus additional, more rigorous theology, usually in a very specific area of expertise, i.e. The Trinity, which see the value of that in the recent problems being correctly identified concerning ESS teaching by the CBMW. The alternative at my seminary was an MABS which would be the equivalent of an M.Div at other seminaries. A Th.M was considered the only appropriate degree for a sr. or teaching pastor and of course was the only appropriate degree for someone who was on a professorial career path on the way to a Th.D. A Th.M was 127 hours with a doctoral quality thesis and would be the equivalent of a doctoral program at a seminary like Southern, or other SBC seminaries. The Th.M was an absolutely brutal academic program and the Th.D,… well, you can imagine. On the other hand, most serious theologians look askance at guys with M.Div and D.Min degrees trying to pass themselves off as serious theologians. There’s nothing wrong with an M.Div degree and there are many, many very fine pastors with M.Div degrees, but if I were to write job qualifications, I would emphasize that an M.Div would be the very minimum expectation, not the preferred degree. Of course, I could be misunderstanding them completely, but I doubt it. Thanks for the explanation fiveonly! I appreciate it. No doubt about it. You have painted another portrait of efforts to sell Jesus by merchandising the gospel, which is not the Gospel at all. Christianity Lite on display once again. Finders fee, pay to play – it all sounds so holy, doesn’t it? Taking Mosaic to the “next level” may not be what church elders and their head-hunting firm have in mind! Thanks for sharing. I appreciate the Scripture passages. > One wonders what kind of church polity exists at Mosaic Church, but it’s clear that members have no input. Elder led, sounds like, since they started this ‘sermon’ talking about how democracy is anti-biblical because it’s divisive. I guess that was before they talked about all that information about, you know, what actually happened and victims, is ‘noise’ that those precious elders and ‘leaders’ have to ignore. Thanks for mentioning what the elder said about democracy. So I wonder if the 5 elders vote on issues? My former church, United Christian Church of Dubai is a 9Marx, elder led, congregational church. Sounds good on paper. In reality the senior pastor rules. Members are not nominated for elder positions, the senior pastor selects them. He surrounds himself with reliable yes-men. The congregation votes 98% in agreement with the senior pastor. Such unity! North Korean dictator Kim Jong-un can also boast of similar unity. These types of churches are ripe for abuse of the membership. Unlimited power and no accountability doesn’t usually end well for the rabble in the pews. Hey Buddy!, I found this information for you: "Mosaic Church Just Another Big Business". Here is the website link: https://thouarttheman.org/2016/09/15/4683/. Thank you.